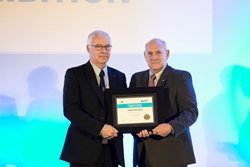 Dr. Gareth Williams Vice President, Head of Plant Quality, Airbus Operations Ltd, was presented with the SAE International William Littlewood Memorial Lecture Award during the SAE 2017 AeroTech Congress and Exhibition, held in Fort Worth, Texas. Dr. Williams has had an extensive career in advanced aerospace manufacturing, including key contributions to the industrial and technology developments at the wing manufacturing plant. Established in 1971, the award provides for an annual lecture dealing with a broad phase of civil air transportation considered of current interest and major importance. The objective is to advance air transport engineering and to recognize those who make personal contributions to the field. The award perpetuates the memory of William Littlewood, the only person ever to be president of both SAE (1954) and the American Institute of Aeronautics and Astronautics. He was renowned for his contributions to the design of, and operational requirements for, civil transport aircraft. Dr. Williams has had an extensive career in advanced aerospace manufacturing, including key contributions to the industrial and technology developments at the wing manufacturing plant in Broughton, North Wales, UK. He has undertaken roles in research, product development, manufacturing engineering and program management. Gareth is a Chartered Engineer, a Fellow of the Royal Academy of Engineering and a Fellow of the Royal Aeronautical Society. He serves on the Governing Board of SAE International, Pittsburgh, USA and has served on the Advisory Council for Aviation Research and Innovation in Europe, the Aerospace Technology Institute in the UK, and the Clean Sky Joint Technology Undertaking in Brussels. He is a member of the industrial advisory boards of several universities.